A screengrab from an episode of Game of Thrones. RECORDS WERE BROKEN over the weekend as over 16 million people in the US alone tuned in for the season finale of Game of Thrones. A total of 16.5 million people watched the last episode of the penultimate series of the HBO fantasy series, according to Variety. The record-breaking number, while just representative of US watching figures, is expected to be mirrored across the world, according to the entertainment website. The figures, compiled by the Nielsen group, found that 12.1 million watched it as it went out at its scheduled time – this makes it the most watched episode in the show’s history. The rest of the 16.5 million figure was made up by the online streams of the finale. Episodes of the current season are averaging around 30.6 million viewers which Variety says is up nearly 8 million viewers from the same point in last year. These figures are the total viewing figures and not just how many watched as it went out at its scheduled time. 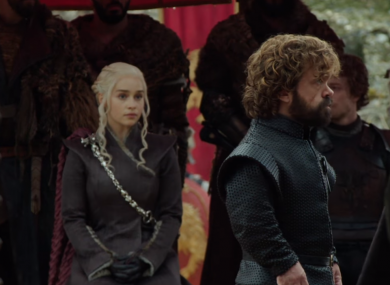 Earlier this month, a group of hackers posted a fresh cache of stolen HBO files online and demanded a multimillion-dollar ransom from the network to prevent the release of entire television series and other sensitive proprietary files. HBO, which had previously acknowledged the theft of “proprietary information”, said it’s continuing to investigate and is working with police and cybersecurity experts. In a five-minute video from ‘Mr Smith’ to HBO CEO Richard Plepler included in the dump, the hackers used white text scrolling on a black background to deliver an ultimatum. In short: Pay up within three days or see the group, which claims to have stolen 1.5 terabytes of HBO shows and confidential corporate data, upload entire series and sensitive proprietary files. Email “Record-breaking season finale of Game of Thrones brings in millions of viewers”. Feedback on “Record-breaking season finale of Game of Thrones brings in millions of viewers”.